Lionsgate’s new drama Life Of Crime is an interesting movie. The movie, which is based on author Elmore Leonard’s book The Switch is the polar opposite of all of the prequels, sequels, and remakes being churned out by Hollywood’s ‘Power Five” studios today. It stands out completely from everything else on theaters and in the realm of home entertainment primarily because of its story. The story centers on the kidnapping of a woman that is married to a rather unpleasant man by two ex-cons, one of which just got out of jail. That aspect is discussed in the movie’s bonus features. So it will be touched on later. The story though, is rather interesting in that it doesn’t necessarily turn out the way that audiences might think. In fact it actually turns the classic crime story a bit on its ear as audiences will see. Another reason that the movie works as well as it does is the acting on the part of the cast. The cast’s acting really serves to highlight the character development that takes place over the course of the movie’s near two-hour run time. Last but not least of note in this recent release is the movie’s bonus material. The behind-the-scenes featurette and the discussion on how the movie came to be adapted from Leonard’s book both shed their own light on the movie, making the whole viewing experience all the richer. That isn’t to take away from the movie’s bonus commentary. It serves its own purpose in the grand scheme of things, too. The end result is a movie that while it definitely walks off the beaten path is well worth the watch if only once. Life of Crime is a welcome respite from all of the prequels, sequels, and remakes currently being churned out by Hollywood’s “Power Five” studios. The central reason for this is its script. While adapted from author Elmore Leonard’s book The Switch, it stays true to the source material, as audiences will learn in watching the movie’s bonus material. The story centers on the kidnapping of well-to-do wife Mickey Dawson (Jennifer Aniston). Mickey is kidnapped by two ex-cons named Louis (John Hawkes—American Gangster, The Sessions, Lincoln) and Ordell (Yasiin Bey a.k.a. Mos Def—The Italian Job, The Hitchhiker’s Guide To The Galaxy, 16 Blocks). The pair originally sets out to kidnap her and extort $1 million from her husband Frank (Tim Robbins—The Shawshank Redemption, The Hudsucker Proxy, Mystic River). There’s just one problem. He is getting ready to file for divorce unbeknownst to both her and her captors. As things progress, a friendship of sorts forms between Mickey and Louis. On the other end, Ordell ends up with Frank’s mistress Melanie (Isla Fisher—Now You See Me, Rango, Wedding Crashers). Considering all of this, one would think that the movie is a comedy. But that isn’t the case. Writer/Director Daniel Schecter took the story in a more dramatic direction, again staying true to the source material. The only way that this is a bad thing is the story’s pacing. It does tend to drag somewhat as the story progresses. But it is still a story worth at least one watch despite this. 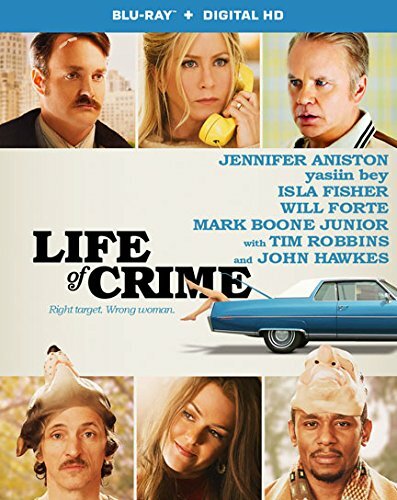 The story on which Life of Crime is centered is an important reason that audiences should give this movie at least one watch. Again as Writer/Director Daniel Schecter notes in the movie’s bonus material, he wanted to stay true to the movie’s source material. That’s because, as he notes, he didn’t like all of the movies that changed the story in its adaptation from its source material. The story itself would be nothing without a cast to carry out the story. And the movie’s cast does quite the job of bringing the story to life. Their interpretation of Schecter’s script makes up for the story’s issues with pacing. Audiences will love the fact that Aniston’s Mickey is such a strong female lead. This goes back to the fact that the story turns the typical crime drama genre on its ear. Mickey isn’t afraid to stand up to her captors, which is what leads to her budding friendship with Louis. Women especially will cheer as Mickey uses a lit cigarette to burn Richard (Mark Boone, Jr.) in his eye. Her overall interactions with Louis and Ordell display so much character development throughout the story. That mix of development and interaction will pull in audiences with ease and keep them engaged right to the end again despite the story’s pacing issue. It’s one more way in which Life of Crime stands out from all of the other major blockbuster prequels, sequels, and remakes currently out there and that are on the way. It still is not the last factor that makes the movie work, either. The last factor that makes Life of Crime work as well as it does is the movie’s bonus material. The last factor involved in Life of Crime’s home release is the bonus material included in the movie’s Blu-ray/Digital HD release. The bonus behind-the-scenes featurette itself offers quite a bit of insight into the movie. That insight includes the thoughts on the movie’s source material from both the cast and director. Aniston also has the chance to discuss her character’s portrayal to some length in the behind-the-scenes featurette. The companion featurette entitled “Envisioning The Big Picture: Shooting Crime” allows Schecter to discuss his reasoning for staying as close as possible to Leonard’s original book in adapting it and the surprise that Leonard actually liked Schecter’s script for his adaptation. There is much more discussed in both features. And audiences will find in taking in the rest of those discussions, they add even more interest to Life of Crime in whole. The same can be said of the movie’s bonus commentary from Schecter and actor Will Forte (Saturday Night Live) who plays a slightly overbearing man trying to win over Mickey throughout the movie. The end result of all of these discussions is a viewing experience that makes Life of Crime even more a story worth at least one watch.